For the Adventurer in all of us! If you love nature and enjoy getting a great workout, a hiking tour may be for you. 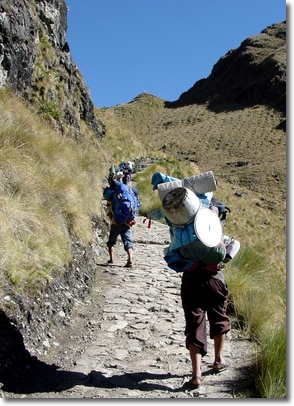 Hiking tours, or trekking tours as they are sometimes known, are about much more than just walking. The most intensive tours can take days to complete and they take you to exciting places which can only be reached by foot. With trekking tours, you can explore caves, remote mountain peaks, villages seen by only a handful of tourists, and the most intimate crevices of the natural world. Trekking tours are extremely flexible and versatile, allowing you to decide on the style of hiking, the intensity of the exercise, and the sights you want to see. Not surprisingly, hiking tours also provide excellent exercise - a 130-pound person carrying a 20-pound backpack can burn more than 1300 calories on a four-hour hike. Trekking improves the condition of your heart and your immune system as well as the density of your bones. As you build endurance and strength, the natural environment provides you with the oxygen you need to feel great, and the natural scenery (not to mention the endorphins your body releases during hiking) clears your mind and makes stress melt away. All that and a vacation too! March on. The experience of a trekking tour is ideal for travelers who enjoy the outdoors. It is a great travel opportunity for anyone who hikes at home, wants a unique vacation, and is looking forward to an active style of travel. Hiking tours vary widely and travelers can choose various destinations, companions, and intensity levels to custom-create the vacation of their dreams. Many trekking tours involve destinations in remote areas rich in wildlife. Tours may take place on mountain trails, along oceans, or deep within forests. Trekking tours also vary widely in the companionship they offer. There are tours for younger hikers, older hikers, and hikers who enjoy different lifestyles. Since you will be spending a lot of time with your tour companions, it is imperative to select a tour which includes hikers you will be able to get along with easily. It is also important to select a tour which involves a level of hiking with which you are comfortable. It is sometimes difficult to remember that hiking is really about being someplace rather than a trek between two places! Hiking tours range from fairly low-impact trails to very intensive experiences which may include rock climbing and other extreme sport opportunities. To stay safe and happy, select a tour which will challenge you but will not overtax your skill level. If you want to create your own hiking tour, a travel consultant can help you do so. More importantly, a travel consultant can ensure that you get the hiking experience you want on your budget. In many cases, a travel consultant will do much of the preliminary research for you, weeding through the details of tours and destinations so that you have all of the information you need to plan a hiking vacation. A qualified travel consultant can also help you to decide what you are looking for in a hike and can explain all of the hiking tour options available, especially regarding quality tour packages that encompass discounted airfare as a part of the tour. After talking with a travel consultant, you will be far more knowledgeable about the opportunities available and will have a better idea of where to turn for the best values. Hiking tour operators offer guides, routes, equipment, logistical support, itineraries, equipment, accommodations, emergency help, outdoor savvy, professional experience, safety precautions, food, and additional activities. Some hiking tour operators offer all of these things, while others may provide only basic emergency aid and itineraries. When selecting a tour operator, you need to make sure that you are offered the amenities you need, excellent safety precautions, and hiking experience which exceeds your own. 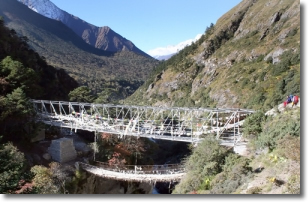 When planning a trekking tour, the first thing you will need to decide is your destination. There are hiking tours available in every continent. You can see North America, Europe, Asia, Australia, South America, and Africa from the hiking trail. Within these destinations, you can hike among jungles, forests, volcanoes, mountains, or ocean-side parks. There are even hiking tours which offer urban hiking among city ruins or major city attractions. If you are having trouble deciding on a tour destination, you may wish to ask yourself what you want to see while hiking. Some tour operators have itineraries offering spectacular bird watching, rare plants, prehistoric caves, ocean views, or other attractions. You can also choose a tour by the activities you wish to pursue while hiking. Some trekking tours cater specifically to photography enthusiasts, history buffs, artists, or spiritual exploration. Some even offer a wide array of extreme sports - such as white water rafting and mountain biking - in addition to hiking. Once you have decided on a destination, you will want to learn all you can about it. Ask your travel consultant for assistance in researching details about climate, elevation, altitude, and terrain. Also find out how much hiking you will do each day. Depending on what you find out, you may need additional equipment or training to prepare you for the rigors of a hike. If you are hiking at high altitudes, for example, you may need extra conditioning and a visit to the doctor to ensure that your body can take the extra stress. If you will be hiking along slippery trails, you may wish to hike with special extra-grip boots. When considering hiking tours, look closely at food, accommodations, and other factors which will impact your non-trekking time. Your tour operator may have chosen specific lodgings or camp sites. Inquire about all of the hotels, bed & breakfasts or camping grounds where you will be staying. Similarly, the tour operator's choice of food and preparation methods are important. Make sure that you are happy with the choices the tour operator is making on your behalf. If you have any special needs or requirements for lodging or food, make sure that the tour can accommodate those by informing your travel consultant early on in the booking process. Find out exactly what costs the tour price covers and which are your responsibility on the hike. After a long day on the trails, you want to be comfortable and happy before dropping off into a well-deserved sleep. Before signing up for any trekking tour, determine the nature of tour operator's typical clients. Tour operators may sign up small parties of less than 6 people or they may choose larger groups of 30 or more. 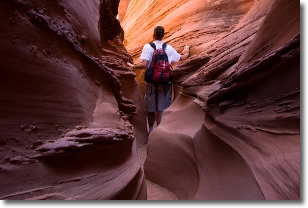 Some tour operators operate private hikes for just one person or for friends and family. Usually, the larger the tour group, the smaller the cost for the tour package. However, larger tour groups can also mean less interaction with the leader. Larger groups may also break off into smaller groups and so offer less camaraderie than a small hike. If you are going on a trekking vacation mainly to see wildlife, keep in mind that larger groups create more noise and so can scare off animals and birds. 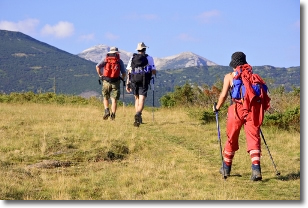 Most people who take hiking tours are friendly and physically fit. Age ranges are typically from 18 to about 60, although tours for older hikers are available. 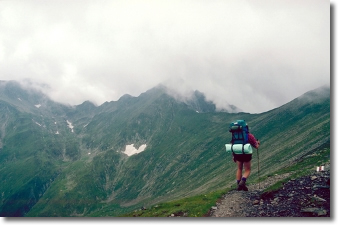 Hiking tours that offer extreme conditions or extreme sports on the itinerary tend to draw younger, college-aged hikers. Some tours allow hikers to bring children although many do not. Find out as much as you can about the group you will be hiking with and choose a group which will let you see what you wish to see and will let you fit in. When considering hiking tours, one final consideration is preparedness. Some hiking tour operators will provide almost everything you need in terms of equipment, while others will provide little more than an itinerary and expertise. Find out what is expected of you and make sure that you know what to pack. Be aware that if you need to buy equipment for a tour, this will add to the overall cost of your trip. Be sure to find out whether any prior experience is needed. Some tour operators ask hikers to take courses or training. This is especially common on more rugged hikes which may include more risks and more physically demanding terrain. Even if no previous experience is needed, some preparation on your part will make your hiking adventure more fun. Learning about the places you will go and perusing hiking guides, travel guides, and wildlife guides, for example, will allow you to appreciate what you see on the trails. Since hiking tours are very physical vacations, your first preparation before any trekking adventure is to get into good physical condition. Work with your doctor and tour operator to create a training schedule in the weeks leading up to the tour. Take hikes a few times a week where you live in the weeks leading up to the hike. This will help you break in any new hiking shoes you have bought for the hike and will get your body used to a trekking schedule. When getting ready for your trip, you will want to ask the tour operator whether a shuttle bus will be made available to you. Many tour operators have a shuttle bus to transport hikers between lodges and trails, to use in emergency situations, and to carry equipment and water. Find out whether you are able to place your equipment on the shuttle. If you are not, you may need to be far more cautious about how you pack your backpack, since you will have to make your pack light enough to carry each day. When packing, be sure to consult with the tour operator about what to bring. Find out what sorts of weather you need to be ready for. You will need hiking shoes and a back up pair if at all possible. These shoes should be designed specifically for hiking and should be made by a reliable brand. They should have great treads which provide traction, a metal shank for support, and ankle support. Your hiking shoes need to be waterproof, light-weight, and very comfortable. Try on many pairs and choose the best quality pair with the most comfortable fit. Bad shoes on a hiking tour can spell great discomfort and even injury. Never break in a new pair of boots or shoes on your trip. Spend many hours hiking in your new shoes prior to your travels to ensure their comfort. You will also need to pack many pairs of socks, long and short sleeved shirts and light rain jackets. Look for the newest synthetic sports materials which whisk sweat away from your body. You may need mittens, hats, and cold-weather wear on some hikes. You will want to pack sunscreen, insect repellant, sunglasses, and rain gear. Depending on the creative activity you favor, you may wish to pack your sketch pad, notebook, or camera to record your trip. Some hikers like taking along walking sticks to help them on hikes and heart monitors or pedometers to help them keep track of their progress. If you are traveling outside of the country or even your immediate area for your hiking tour, ask your doctor to recommend you to a physician with travel medicine experience. Inquire about any vaccines you may need for your journey. Also ask about precautions regarding water and food you need to consider for your destination. Depending on where you go, you may need to make special provisions for water and food to ensure that what you are eating and drinking is safe. If hiking at altitudes above 7,000 feet, special considerations are involved and should be discussed with a doctor. Talking to a knowledgeable travel medicine specialist is your best way to ensure that you will enjoy your active travels to the utmost. If you are leaving the country, you may need a passport and visa. It is good to arrange for these travel documents well in advance in case there are delays. You will also want to arrange for travel and health insurance to make sure that your tour is hassle-free. Finally, if you are traveling to your destination by airplane, be aware that new airport regulations may affect your ability to travel with your equipment. Many hiking boots, for example, contain metal shanks which may set off travel detectors. You may need to check much of your hiking equipment before getting on the plane. Drink plenty of water, wear sunscreen and a hat and don't push yourself beyond your physical limits. Even on overcast days, the sun can wreak havoc on unprepared hikers. Follow all the rules that your tour operator sets out for you. These rules are made for your own safety. Only go on hiking tours you know you can physically handle and only on approval by a qualified doctor. In most cases, the tour operator will note that you are taking the tour at your own risk, so it is your responsibility to make sure you can handle the trek. Respect the environment, the tour operator, your hiking companions, and anyone you meet on the trip. Be friendly and do not go off by yourself away from approved hiking areas. Do not pick up or remove plants or animals from their natural environment. Do not litter. Strive to leave the environment just as you left it and everyone will be safer. Use good equipment - especially good hiking shoes. If your tour operator offers you equipment, make sure it is safe and in good condition. If you buy your own, make sure you buy the correct equipment from a qualified store. Get a salesperson to help you. As with all travel, good trip interruption and medical insurance is highly recommended. Remember that your own medical insurance policy may not cover you for out-of-country travel. There are hiking tours out there for almost every trekking enthusiast. If you have been trying this sport yourself or if you can picture yourself getting is the best possible shape over your next holiday, a trekking tour is an exciting way to hit the road!